On 24 May, Tate Liverpool celebrated the 25th anniversary of its opening, and twenty-five years of the regenerated Albert Dock. I remember it well and I can remember the eye catching poster with a lobster on a telephone stating ‘JUST DALI’. It actually scares me to think it was 25 years ago, as it really doesn’t seem that long ago. I am 48 now and was 23 then. In another 25 years time I will be 73… gulp! And that really does provide a sobering reminder of the way events and milestones can have the surprising habit of telling you how much time has gone. My first memory of a world cup at the age of 14 in 78′ blissfully unaware of punk’s effect on the music scene, having been at boarding school for the previous 5 years. Being 36 when 9/11 occurred in 2001. 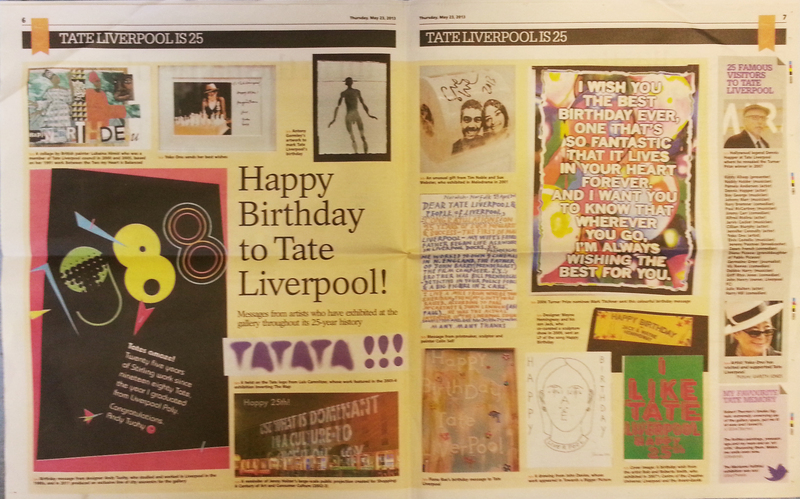 Well, needless to say, I was very proud to have been asked to supply a goodwill message to celebrate Tate’s 25 years. Here’s to another 25, when I am sure I will be raising a mug of cocoa to a much loved art venue’s continuing success and celebrating my son’s 25th birthday too! If you can still find this post in 25 years time Master Tuohy, mine’s the one in the bottom left hand corner of the Liverpool Post.